Recently released statistics showed that traveling is increasingly becoming a regular part of life for millions of Chinese. A second Chinese time-use survey by the National Bureau of Statistics (NBS) showed that the average daily leisure time in the country was one hour and five minutes last year, an increase of 25 minutes compared with 2008, when the survey was first conducted. Traveling is now favored by a growing number of Chinese people as an important leisure activity. 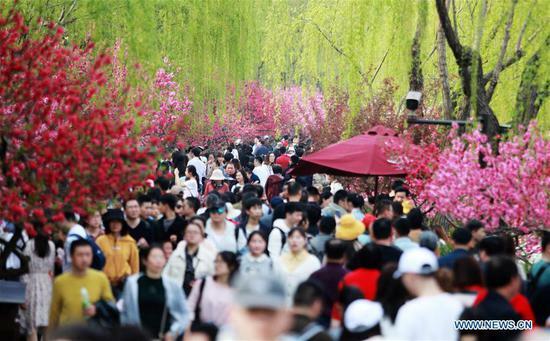 China saw 112 million domestic tourist trips during this year's three-day Qingming Festival holiday from last Friday to Sunday. The number of domestic trips taken by Chinese residents during last year's holidays, which includes the Spring Festival, Qingming Festival, Labor Day and Dragon Boat Festival respectively rose 12.1%, 8.3%, 9.3% and 7.9% from a year earlier, according to statistics from the China Tourism Academy (CTA). The NBS data showed that Chinese travelers made 5.54 billion trips within the country in 2018, more than twice that of 2008's figure of 1.71 billion. In addition, the total number of outbound trips reached 162 million, a marked contrast to only 45.85 million in 2008. Over the past decade, China's outbound tourism registered double-digit growth, making it the largest source of tourists and tourism expenditure in the world. Meanwhile, Chinese travelers are seeking to engage more with regional culture, manifested in the rising popularity of museums and red tourism sites. Nearly 1 billion visits were made to more than 20,000 exhibitions held by 5,136 museums across China last year, according to the People's Daily, a state-run media outlet. A CTA report also revealed that cultural creativity and smart technologies have made China's red tourism sites more appealing to young tourists, especially those of the post-80s, 90s and 00s generations. Recently released statistics showed that traveling is increasingly becoming a regular part of life for Chinese people.